Bill Gates: Big Prophet and more Profit! I saw this article on the I ♥ Programming facebook fanpage and thought I’d share it with you. ‘Emails will make meetings more efficient’ – well they would if they kept it simple and to the point but people tend to waffl and get off the point. This is their failing and not one of technology. ‘Wireless Networks’ – (15 years ago) Gates said ‘Mobile devices will be able to send and receive messages, but it will be expensive and unusual’. Well if he’d only predicted 10 years into the future he was right – the fact they are much cheaper and usual now just shows technology is changing faster than we think. ‘Social Networking‘ is and can be used to connect with and then meet people, it also makes it easier to keep in touch. You will still find those that like to hide away though, using it as a substitute for real socialising. ‘Internet and the web’ is not the information highway that he imagined, although you can think of it as the beginning of the highway. The future is not here yet but people still wait and see, when they will get evidence of this infinite super intelligence! Verdict: Miss. Gates’s view of e-mail now seems naively Utopian, failing to account for unintended consequences. If anything, e-mail has made workplace meetings more frequent and less efficient. “Didn’t you get that e-mail?” is probably the single most common question posed at meetings, a query that often leads to … another meeting. By some estimates, nearly 40 percent of workers spend at least two hours of the work day sifting through e-mail, leading some companies to adopt policies aimed at reducing e-mail glut. One frequent solution: more face-to-face meetings. Verdict: Hit. Gates’s wallet PC is more or less today’s mobile smartphone with voice capability added. Verdict: Miss. Today, receiving a wireless video stream is neither expensive nor unusual; in fact, it’s so commonplace that most people don’t give it a second thought. Gates failed to anticipate that wireless would become cheaper and faster, but his chief mistake was a common but flawed assumption among techno-futurists: that new technology is adopted chiefly on the basis of technological superiority rather than social factors. Even though most wired networks still have greater bandwidth than wireless nets, that’s trumped by the tremendous social utility of wireless, allowing information to be accessed anytime, anyplace. Verdict: Hit and Miss. One of the killer apps of the information highway has turned out to be social networking. Facebook has more than 400 million registered users worldwide and countless other social networks are creating new connections among people. But friendships formed online don’t regularly lead to face-to-face meetings. Far more common is the user with 250 Facebook friends, most of whom he rarely, if ever, sees in person. Verdict: Miss. Gates was right that the information highway would carry video, but he completely misread the social and economic factors that would shape its use in online commerce. How on earth would a harried florist find the time to hold a videoconference with every customer who orders flowers for Mother’s Day? What company would absorb the colossal expense of having orders changed at the last second according to customers’ shifting whims? Gates’s vision of online shopping has turned out to be a lot like past predictions about personal jet packs and moving sidewalks: a future that’s technologically possible but socially and economically impractical. Verdict: Hit. What came to be called webcams are standard issue on PCs, or can be purchased from Bill Gates’s favorite company for under $30. Verdict: Miss. Gates’s notion that the Internet would play a supporting role in the information highway of the future, rather than being the highway itself, was out-of-date the day The Road Ahead was published. Even Gates realized it. 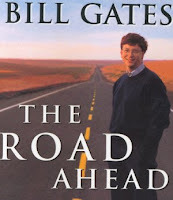 Shortly before his book hit the stores, Gates reorganized Microsoft to focus more on the Internet, and he made major revisions to a second edition of The Road Ahead, adding material that highlighted the significance of the Internet. In many ways, Gates’s cloudy crystal ball regarding the Internet amounted to wishful thinking. Gates built Microsoft into a global powerhouse by selling proprietary software that users loaded onto their PCs. He wasn’t likely to warm to the idea that the same functions could be delivered cheaper and faster through a decentralized network that he couldn’t control. Of all of the predictions Gates missed in The Road Ahead, this one might be the costliest. Microsoft is still playing catch-up as a result of failing to anticipate the dominance of the Internet. Verdict: Little Hit, Big Miss. It’s true that technology lets you explicitly indicate allowable interruptions — you can use caller ID to dodge unwanted calls or sign up at the National Do Not Call Registry to nix telemarketers. But the notion that technology would pave the way to greater privacy has turned out to be anything but true. Privacy has become one of the great casualties of the computer age, a reality most people have come to accept as the cost of traveling on the information superhighway. Don’t bother looking for privacy on The Road Ahead — it’s already in the rear view.